For racing fans, this is a huge weekend in Kansas City. 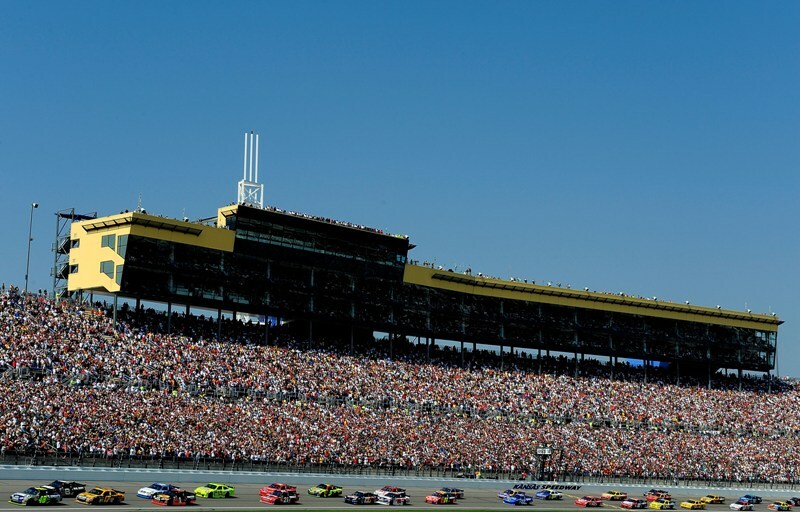 Headlining the weekend’s high-octane activities is the NASCAR Sprint Cup Series event at Kansas Speedway. The Camping World Trucks will also race there on Saturday. But don’t forget all the local racing, including two nights at Lakeside, culminating in the big World of Outlaws event on Saturday. If you like your automotive fun to be a little slower, there are some great cruise nights in Parkville and Blue Springs, as well as a few car shows around town. 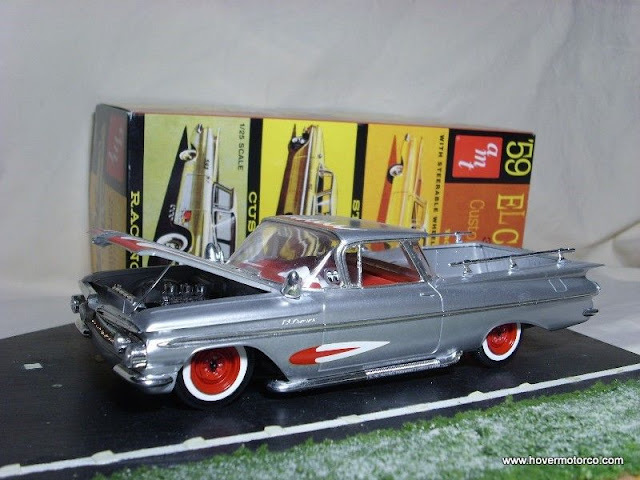 Plus, how can you forget the Heartland Model Car Nationals in Overland Park? Does that sound like a lot to digest? Well, it is. But we’ve got the full weekend schedule of events to help you make sense of it all. Just be sure to call ahead or do a little more research if weather looks like it might screw things up. I don’t think it will. I just felt like I had to say that. Friday, June 3. Overland Park, Kan. Longbranch TGIF Cruise. Dan's Longbranch Steakhouse and Saloon, 9095 Metcalf, 66212. 6:00 p.m. -10:00 p.m. For more information, call Dan at (913) 642-9555. Saturday, June 4. Parkville, Mo. Parkville Monthly Cruise Night. English Landing Park, Historic Downtown Parkville. 4:00 p.m.-8:00 p.m. For more information, call (816) 505-2227, or e-mail msparkville@sbcglobal.net. Saturday, June 4. Neosho, Mo. Neosho Rotary Club Car and Bike Show. Historic Downtown Square in Neosho. For more information, call Kevin at (417) 850-0940, or visit their event website. Saturday, June 4. Overland Park, Kan. 2011 Heartland MG Regional Car Show. 81st and Sante Fe Parkway. For more information, call Ronald at (913) 681-9210, or visit http://www.heartlandmgregional.com/. Saturday, June 4-Sunday, June 5. 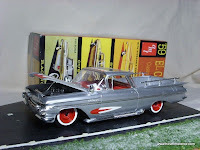 Overland Park, Kan. Heartland Model Car Nationals presented by the KC Slammers Model Car Club. Overland Park Convention Center, 6000 College Boulevard, 66211. Contest registration Saturday from 4:00 p.m. to 10:00 p.m. Judging begins at 10:00 p.m. (closed to entrants and public). Swap meet and general admission begins at 9:00 a.m. on Sunday. Contest awards at 3:00 p.m. For more information contact Bill at (913) 250-0906 or wlb19@yahoo.com, or e-mail Robert at umberto659@yahoo.com. You can also visit http://kcslammers.com/. Saturday, June 4. Sugar Creek, Mo. 34th Annual Show-Me Rods River Run. Labenite Park, M291 and N Courtney Road, on the Missouri River. Registration is from 8:00 a.m.-11:00 a.m. Ballots returned by 1:00 p.m. Awards at 2:00 p.m. For more information, call Dan (816) 313-8706, or visit blueridgechopshop@comcast.net. Satuday, June 4. Independence, Mo. Summer Cruise-In at the Hartman Heritage Center. Jackson Drive next to Buffalo Wild Wings. 6:00 p.m. For more information call Jim at (816) 808-1154, or visit their Facebook page. Satuday, June 4. Atchison, Kan. Atchison River Rod Cruise Night. Sonic Drive-In, 10th and Main. 5:00 p.m. For more information, call Donna at (913) 367-0344, or visit their Facebook page. Satuday, June 4. Blue Springs, Mo. Blue Springs Cruise-In. Downtown Main St (just west of 7 Hwy and Main St) between 10th and 12th Streets. 5:00 p.m. For more information, call the Blue Springs Parks and Recreation Department at (816) 228-0137, or visit their Web page. Satuday, June 4. Harrisonville, Mo. Heartland Road-Runners Cruise Night. Coffee Cats Coffee House, 1919 N Commercial, 64701. For more information, call Kenny at (816) 258-1741. Satuday, June 4. Spring Hill, Kan. Classic Cruisers Cruise Night. Sonic Drive-In, 909 N Webster, 66083. 6:00 p.m. For more information, call Rick at (913) 352-6845, Gene at (913) 352-6763, or e-mail tesmith@kckt.net. Sunday, June 5. Kansas City, Mo. Art of the Machine Display featuring the Kansas City Horseless Carriage Club. 10:00 a.m.-2:00 p.m. Kansas City’s City Market. For more information, visit http://www.thecitymarket.org/, or e-mail ppowers@copaken-brooks.com. Sunday, June 5. Kansas City, Kan. J.C. Harmon Hawks’ Show n’ Shine. J.C. Harmon High School. 2400 Steele Rd. 8:00 a.m.-5:00 p.m. For more information, call Megan at (913)627-7103 or (913)387-8532, or visit the Facebook page. Sunday, June 5-Saturday, June 11. Overland Park, Kan. Plain Ole A's “Planes, Trains and Model A’s” 2011 Midwest Meeting. Marriott Hotel (and Convention Center and other Kansas City attractions), 10800 Metcalf Ave, 66210. For more information, visit http://www.plainolas.com/2011.html. Yeah, there are big races at Kansas Speedway, but don’t forget to check out the World of Outlaws touring series show at Lakeside Speedway on Saturday. It’ll be the better show—guaranteed. Friday, June 3. Kansas City, Kan. Weekly Racing - Kenny's Tile Night. Lakeside Speedway, 5615 Wolcott Dr, 66109. (Note, C.A.R.B. Night has moved to July 15). 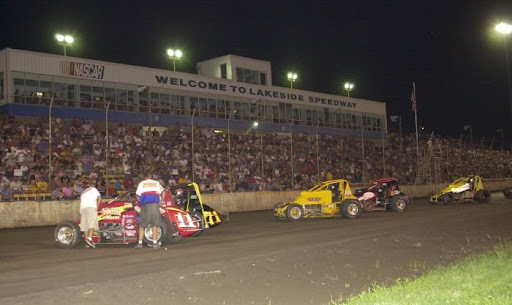 For more information, call (913) 299-2040, or visit http://www.lakesidespeedway.net/. Friday, June 3. Kansas City, Mo. Friday Night Grudge. Kansas City International Raceway, 8201 S Noland Rd, 64138. For more information, call (816) 358-6700, or visit http://www.kcironline.com/. Friday, June 3. LaMonte, Mo. Weekly Racing. L A Raceway, 11649, 65337. For more information, call (660) 563-9878, or visit http://www.laraceway.com/. Friday, June 3-Saturday, June 4. Grain Valley, Mo. Weekly Racing. Valley Speedway, 348 E Old 40 Hwy, 64029. For more information, call (816) 229-2222, or visit http://valleyspeedway.com/default.aspx. Saturday, June 4. Kansas City, Kan. NASCAR Camping World Truck Series O'Reilly 250. Kansas Speedway, 400 Speedway Blvd, 66111. 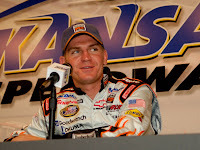 For more information call (913) 328-3300, or visit http://www.kansasspeedway.com/. Saturday, June 4. Kansas City, Kan. World of Outlaws Sprint Car Series. Lakeside Speedway, 5615 Wolcott Dr, 66109. For more information, call (913) 299-2040, or visit http://www.lakesidespeedway.net/. Saturday, June 4. Nevada, Mo. Weekly Racing. Nevada Speedway, S Barrett Ave, 64772. For more information, call (417) 667-5859, or visit http://www.nevadaspeedway.net/. Saturday, June 4. Topeka, Kan. Super Saturday Showdown on the Dirt Track. Heartland Park Topeka, 7530 Topeka Blvd, 60610. For more information, call (785) 862-2016, or visit http://www.hpt.com/. Saturday, June 4-Saturday, June 5. Kansas City, Mo. NHRA Missouri State Bracket Championship. Kansas City International Raceway, 8201 S Noland Rd, 64138. For more information, call (816) 358-6700, or visit http://www.kcironline.com/. Sunday, June 5. Kansas City, Kan. NASCAR Sprint Cup Series Kansas Speedway 400. Kansas Speedway, 400 Speedway Blvd, 66111. 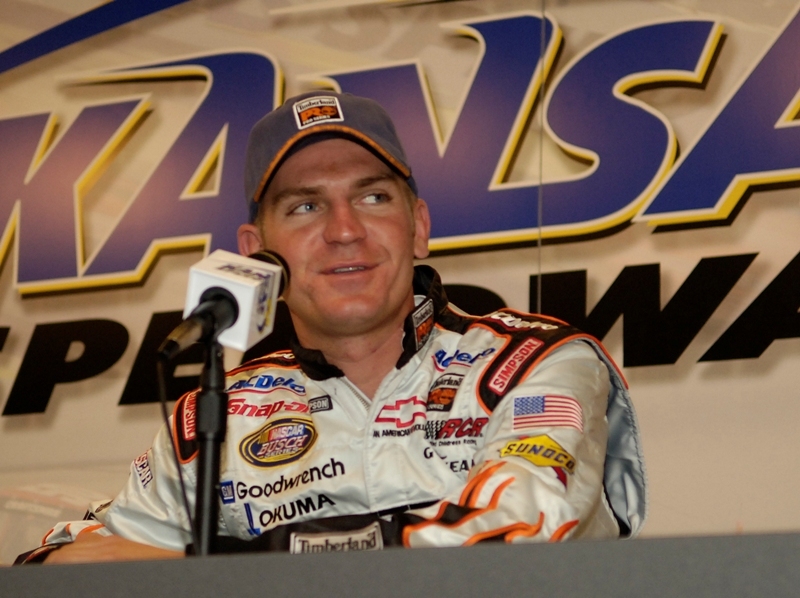 For more information, call (913) 328-3300, or visit http://www.kansasspeedway.com/. As you can see from the local racing calendar above, the NASCAR Sprint Cup and Camping World Truck Series’ will be right here at Kansas Speedway this weekend. So needless to say, this is a big weekend for auto racing around here. 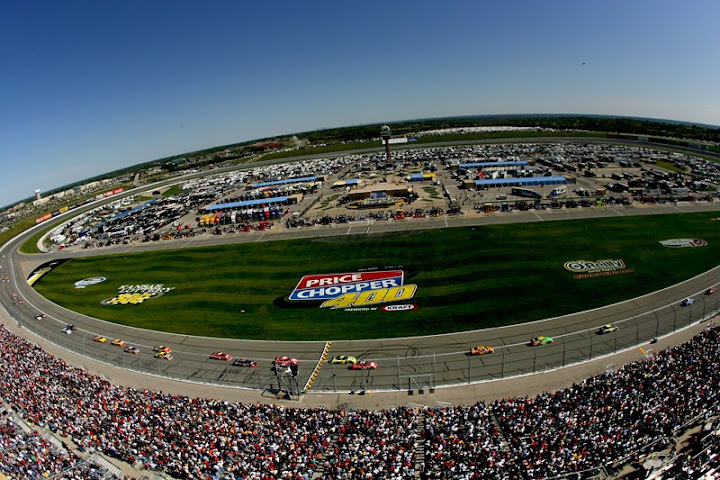 Also, the NASCAR Nationwide Series will be at Chicagoland Speedway, which looks almost exactly like Kansas Speedway on TV, so it’ll be hard for most people to know they are even in a different location. This is the first time we’ve had a Sprint Cup event at Kansas in June, as this year we have two of these big races on the schedule. It’s pretty cool that they were able to make this happen, although it should be interesting to see how well they fill the grandstands this weekend. Saturday, June 4. Kansas City, Kan. NASCAR Camping World Truck Series O’Reilly Auto Parts 250. Kansas Speedway. 1:00 p.m. (C/T), SPEED TV. Saturday, June 4. Joliet, Ill. NASCAR Nationwide Series STP 300. Chicagoland Speedway. 7:00 p.m. (C/T), ESPN TV. Sunday, June 5. Kansas City, Kan. NASCAR Sprint Cup Series STP 400. Kansas Speedway. 12:00 p.m. (C/T), FOX TV.